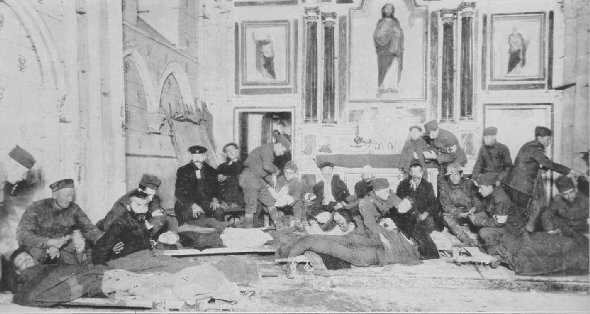 French refugees being cared for by members of the 306th Ambulance Company, 77th Division, at a first aid station in a church at St. Pierremont, in the neighborhood of Sedan, France, a few days before the signing of the Armistice. In liberated northern France, M. and Mme. Balous, prisoners at Brieulles-sur-Bar for four years, thank their doughboy deliverers, Philip Tangor of Co. I, 308th Inf., 77th Div., and Allen Floyd of Co. I, 166th Inf., 42nd Div. 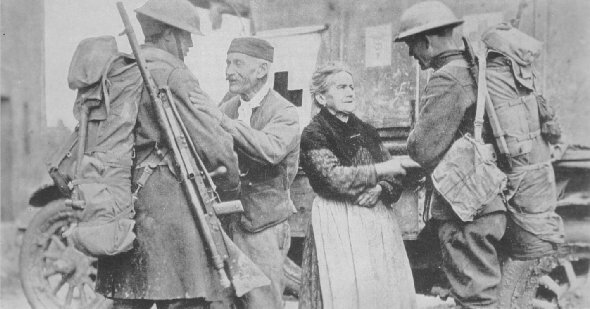 Three million French, unable to escape before the German flood engulfed them, labored for 4 years under the enemy.